DECOREX D-MX EL – X-film® Selbstklebefolien "Made in Germany"
today we would like to inform you respect our running decorative vinyl DECOREX D-MX. 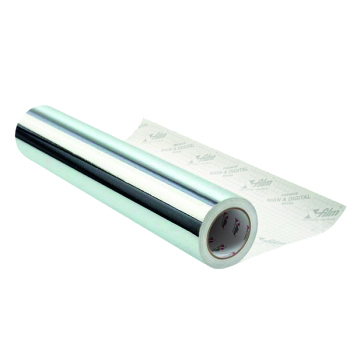 DECOREX D-MX Easy Liner is a 50mμ metallized mirror finish film in silver, gold and copper, with a semi-permanent acrylic adhesive with microchannels. Easy Liner adhesive technology ensures easy, efficient and bubble-free application. After 24 h the adhesive strength is ≥ 10N / 25mm. D-MX EL offers a brilliant, chrome-like surface in the colors gold, silver and copper. Use this excellent vinyl for decorative lettering and exclusive, creative design solutions on glass and many other surfaces. This B1-certified film with outstanding plotter properties is printable in screen, offset and UV printing. If you you need further information, please do not hesitate to give us a call.